Vo Van Thuong, head of the Party Central Committee’s Commission for Information and Education has urged the Vietnam Youth Federation (VYF) and the Union of Youth Federations of Cambodia (UYFC) to deepen their cooperation, focusing on educating young people on the history and friendship of the two countries. The two sides should also boost their partnerships in education, science-technology and sports, Thuong told UYFC President Hun Many during their meeting in Hanoi on August 29. He used the occasion to congratulate Cambodia on the successful organisation of its parliamentary elections in July, and the Cambodian People’s Party (CPP) on its victory in the elections, expressing his hope that the party will go on to reap great achievements in the time ahead. 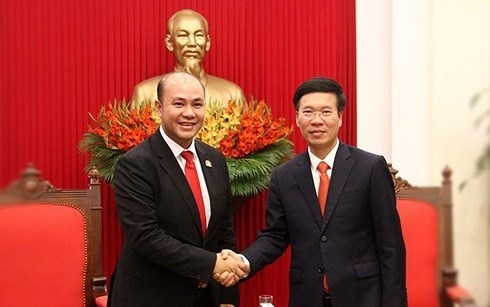 Thuong said he believes that Hun Many’s visit will contribute to enhancing the traditional friendship and comprehensive cooperation between Vietnam and Cambodia, and especially their younger generations. The Vietnamese official extended his condolences to the victims of the recent fire in Phnom Penh and affirmed Vietnam’s consistent foreign policy that prioritises its relations with Cambodia. For his part, Hun Many extended his greetings to the Vietnamese Party, State, and people on the 73rd anniversary of its National Day (September 2). He said the UYFC will continue its close coordination with the VYF to constructively contribute to the fine neighbourliness, traditional friendship, and comprehensive , sustainable, and long-term cooperation between Vietnam and Cambodia.